This is the type of movie that is given a green light at a movie executive meeting…”Melissa McCarthy is James Bond.” The instinctively funny Ms. McCarthy is surrounded in this comic spy movie by Jason Statham, Jude Law and Rose Byrne, all sending up their various images, and the story is done with a straight face – except for the inevitable audience laughter. This film has the same rat-a-tat joke count as “The Heat,” with the same silly bonding elements as “Bridesmaids.” Paul Feig knows how to generate laughs, and does it mostly by allowing free reign for Melissa McCarthy to express her offbeat style of delivery and presence. Susan Cooper (McCarthy) is a cubicle jockey for the CIA. Her main assignment is surveillance backup for Bradley Fine (Jude Law), a suave and sophisticated spy straight out of Central Casting (or in this case, Central Intelligence). When a shoot-out incident goes awry, Fine is disposed of, but his mission is still hot. Cooper volunteers to take his place. This is not greeted with enthusiasm from a fellow agent, the intense Rick Ford (Jason Statham), but is reluctantly signed off by Cooper’s boss Elaine Crocker (Allison Janney). Cooper is going undercover, as a cat lady and unmarried tourist. This ruse falls apart when Cooper encounters Rayna Boyanov (Rose Byrne), a foul-mouthed intermediary for the evil plot that needs foiling. And Agent Cooper just might be the right man…er…operative. 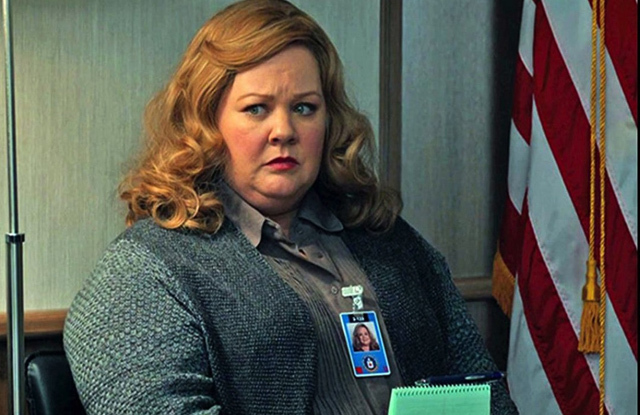 Of course, the engine of all this tomfoolery is Melissa McCarthy. She uses all the tools in her comic kit to make Susan Cooper both sympathetic and hilarious. The story is a typical fish-out-of-water game, as the more conventional Susan takes on the James Bond spy world with a bit of a sideways approach. As writer/director Paul Feig told HollywoodChicago.com, Susan is an “unassuming, relatable person who is just trying to get through life.” That note makes McCarthy’s spy that much funnier. Another comic genius ingredient was casting. Jason Statham is fast becoming one of the most versatile and appealing straight men in the business. He uses his crazy action movie persona to perfection, especially as he plays off the less stressed Susan. He’s also effective when he botches up situations because of his man-of-action techniques, and his comic performance – that’s right, his comic performance – is a highlight. 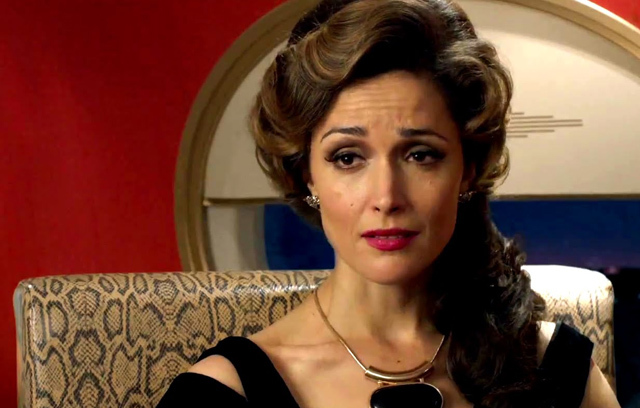 Paul Feig has a deep bench, and he called upon Rose Byrne – who portrayed a totally different but equally weird and funny character in “Bridesmaids” – to play a foreign villain. Her timing is exquisite, and she and Cooper have a put down contest that leaves no one safe. And finally Jude Law, with a help of a nice Sean Connery-style hair piece, capitalizes on his suave image by outdoing the Bond image with his Bradley Fine character. My favorite thing about Paul Feig movies are the sardonic nature of his characters. They comment upon the action in rapid fire barbs, most of them hitting the mark. Feig also loves his characters, and makes sure to give everyone their funny moment, just by playing off of the one-of-a-kind personas he creates. It’s one thing to do a spy comedy, done hundreds of times before, it’s another to play it straight enough so that the smallest elements have potential for laughs. One small complaint – it always seems that Feig never knows how to end his wacky films, but it does leave us wanting more.